Not Without You is the name and the ethos for a fantastic wine, food and fashion outlet. Friends Helen Pfahlert, Phillip Sunderland and Stuart Montgomery have established a unique collaboration that offers the best in dining, wine and fashion, right in the CBD on High Street. 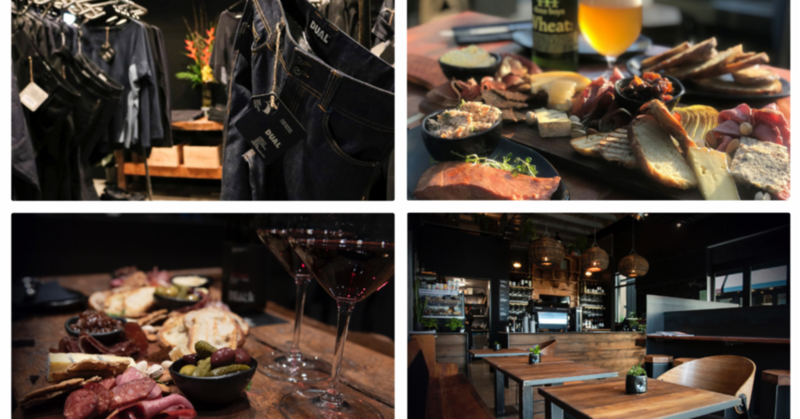 The wine bar is accompanied by DUAL – an established Christchurch brand that both Phillip and Stuart have worked on reinvigorating. DUAL’s offering is now classic raw denim with Dutch minimalist inspiration. Phillip says the concept of Not Without You is relatively simple – supporting local, to benefit locals. When looking for a space, the current location next to New Zealand fashion brands Plume and World struck a chord with the trio because of DUAL, the denim aspect of Not Without You. sit on each table. Reclaimed seating is from the Linwood Baptist church, and the wooden stools are made with wood from Southern Demolition. Even the refrigerators were manufactured locally, by Debonair in Woolston. The denim used at DUAL is made just 800 metres away on Lichfield street. Now that’s local. There’s a distinct feeling that the Not Without You crew are really committed to the ideology behind it all. It’s full of “intentional decisions,” says Phillip. They are particular about ensuring their offerings aren’t coming from big corporates. to them. When you buy from the Donaldson family from Pegasus Bay or the Thomas family from Greystone, it means something. They know us. We have a relationship with them. Helen adds that it’s also nice to share New Zealand stories. “We’re able to work with local suppliers, and send their story out to our customers. It’s mutually beneficial in that respect,” she says. Eaton Drink Co supply menu items such as the smoked salmon rilette and Cheesemongers provide the cheese used in the dishes. There’s a solid collection of Kiwi wines, and they offer wine tastings events. There’s even plans for Friday barbecues and the fashion space has the ability to host functions.